While we have an assortment of reviews of the Ashton VSG it is surprising that we haven’t reviewed anything in the Ashton ESG Series. I would’ve thought our resident baller, Brian Hewitt, with all his Zino, Davidoff and Ashton dinners would’ve reviewed one of the four releases by now. Maybe it is the $20+ price tag of the ESG? 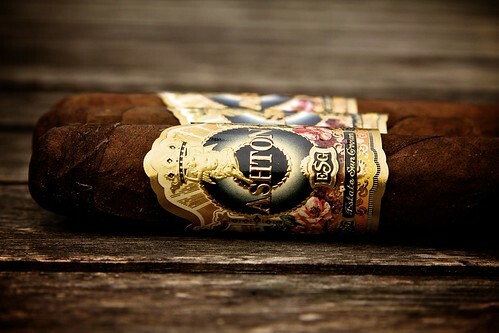 I won’t rehash all the details you probably already know about the Ashton Estate Sun Grown like how the ESG is blended by the Fuente Family or how its milk chocolate looking wrapper isn’t used on any other cigar. All that stuff you probably already knew. Some may balk at the price of the Ashton ESG or as Walt told me, the VSG is a much better bargain. All that maybe true but I think the ESG is unique and complex enough to dish out an Andrew Jackson and an Abraham Lincoln for. I’m not saying I’ll be smoking these on a daily basis but with the graduation and wedding season upon us, the Ashton ESG should be one of those celebratory cigars to be considered. I know its on my radar. Great Review Jerry, I like the VSG but haven’t had the ESG yet and at that price I will prob. only pick one up for a very special occ. Thanks for the review, Jerry. I got that same Christmas sampler (the only way I could affort one), but I think I got the 20-Year Salute. The other two sticks were the Tatuaje Black and Oliva V Maduro. I’m just waiting for the right occasion to break it out, but it sounds like it’ll be a great smoke. Thanks jjo! I was struggling trying to remember what else was in that sampler. I really only got it for the Armada and Dirty Rat. Worth the price just for those two. Expensive, but a helluva smoke.